Guiding Ohio Online is a State Library administered competitive LSTA (Library Services and Technology Act) grant. The purpose of the grant is to allow libraries in rural Ohio to hire a dedicated technology trainer for their library. The technology trainer is hired as an independent contractor in a full- or part-time capacity depending on the needs of the library for a 1-year period. The current year’s grant period is October 1, 2019 – September 30, 2020. Trainers can assist with computer instruction, technology-focused community outreach, one-on-one instruction, and other technology related duties. The LSTA funding covers 75% of the project costs; the remaining 25% must come from a local cash match. This cash match typically comes from the library, but may come in whole or in part from a partner organization. Please be aware that the cash match cannot come from another federal funding source. Click here to view Guiding Ohio Online infographic. Information on this page is intended for use by libraries participating in the current Guiding Ohio Online program. The Guiding Ohio Online program year runs from October 1st to September 30th. We recommend that you advertise for, interview, and have your digital literacy trainer ready to begin working on October 1st. Please remember no grant funds can be spent before the program start date. We suggest that project coordinators set up regular meetings with their digital literacy trainers in formal or informal meetings. These regular meetings will allow the project coordinator to ensure statistics are being gathered correctly and everything is going well with the program. Additionally, we recommend that project coordinators and fiscal contacts also have regular meetings to ensure the grant funds are being spent in a timely fashion. Click on the examples below of digital literacy trainer job descriptions and a sample trainer contract. Compiled here are some useful templates that past participating libraries created or found useful. During the program year 2017-2018, the digital literacy trainer for Athens County Public Libraries visited each location once a week, if possible. In order to book one-on-one appointments, patrons or staff could fill out the form on the library’s website with their name, contact information, help topic, and which branch location worked best for them. During the 2017-2018 program year, Adams County Public Library employed multiple part-time trainers. In order to facilitate the gathering of data for the quarterly narrative reports, the trainers filled out this Google form at the end of each program. The data was automatically entered into a Google Sheet which could then be exported into an Excel document if needed. Invoice for use by digital literacy trainer. Because a Library Services and Technology Act (LSTA) grant administered by the Institute of Museum and Library Services (IMLS) has funded your Guiding Ohio Online trainer, your library must acknowledge IMLS and the State Library of Ohio in all spoken, online, and printed promotional materials. Promotional materials include program introductions, interviews, websites, emails, discussion list posts, flyers, program signage, advertisements, presentations, slideshows, evaluation forms, newsletters, and press releases. The IMLS Surveys are required to be made available at the end of every program or presentation for patrons or library staff to fill out. Libraries are allowed to add additional questions to the survey. Please do not include the additional questions in your reporting. Have any questions regarding Guiding Ohio Online trainers, hiring best practices, etc.? Please contact Technology Consultant, Anne Kennedy at akennedy@library.ohio.gov or by calling 614-466-1710. 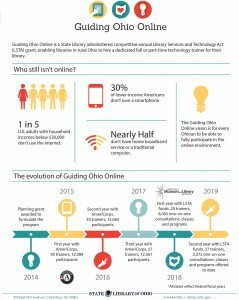 For any questions, concerns or comments regarding the funding or budget of Guiding Ohio Online, please contact the LSTA Office at lsta@library.ohio.gov or by calling 800-686-1532 or 614-644-6863. Applications and Proposed Budget Forms for the 2019-2020 Guiding Ohio Online program are due May 17, 2019. If you have any questions, concerns or comments regarding the funding or budget of Guiding Ohio Online, please contact the LSTA Office at lsta@library.ohio.gov or by calling 800-686-1532 or 614-644-6863. If you have any questions, concerns or comments regarding Guiding Ohio Online trainers, hiring best practices, etc. please contact Technology Consultant, Anne Kennedy at akennedy@library.ohio.gov or by calling 614-466-1710. State Library staff will conduct workshops on the Guiding Ohio Online application process on the dates listed below. Whether you’re a current Guiding Ohio Online library or considering joining the program for the first time, come to one of the in-person training sessions to learn about the program in general, how it works, how it’s funded, the reporting required, and how to apply. Interested libraries can receive in-session help on filling out their applications and budget sheets from State Library staff.